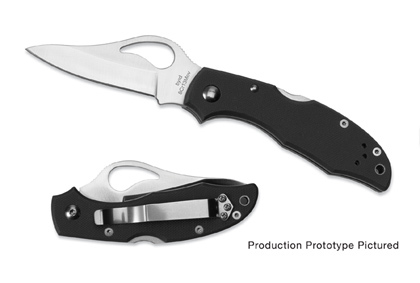 SPYDERCO BY04GP folding pocket knife by Meadowlark series. Designed for Daily Use. Smooth blade sharpened unilaterally. Hole at the top, made of stainless steel grade 8Cr13MoV. Black synthetic handle of type G-10 and a hole in the rear end. Clip tether on one side.